Assisting guests with special needs to participate in DRC's interactive programs. Dolphin Research Center is committed to making it possible for everyone to enjoy experiencing dolphins in one of our interactive programs. If you or someone in your family has a challenge, we can assist you. 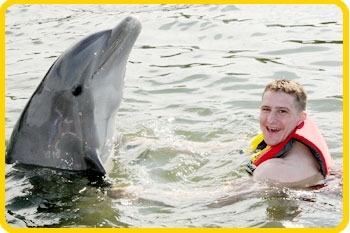 For more information and to make a reservation contact us at specialneeds@dolphins.org. 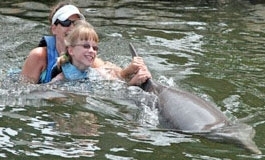 View complete descriptions and prices of Dolphin Research Center’s interactive programs. 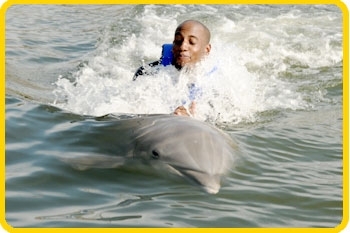 A joy-filled, goal-oriented experience interacting with dolphins. Two swim with the dolphin programs. 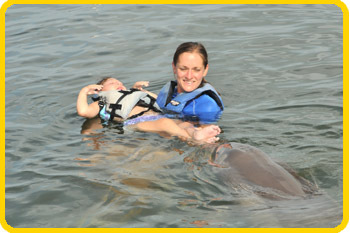 The Special Needs Dolphin Pathways Program is a private program created for children and adults with special needs. Sessions are designed to help each individual work toward personal goals. These goals are established by the family and DRC staff prior to the visit and may include physical, emotional, social, or other aspects of daily life. 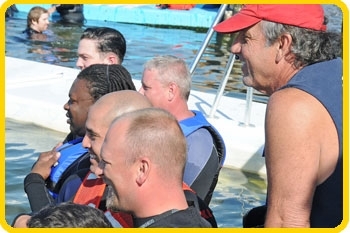 Participants enter into the dolphins’ world where educational and recreational activities are introduced to help increase motivation and enhance the personalized experience. Individuals may learn to feel more positively about themselves in an environment that promotes fun, play and learning. They then have the opportunity to bridge their experience back into their personal lives. Most of all, they are able to have a fun-filled time away from the stress of medical, physical, or emotional concerns. Our dedicated, experienced, professionals patiently establish a rapport with each Pathways participant. Through this connection, a team forms that includes not only the guest, but also the dolphins! Individualized goals are first introduced in the educational and recreational classroom sessions. Activities include a variety of modalities, chosen to advance each person’s progress. 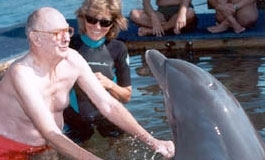 These sessions then support and reinforce the dolphin interactions. Dolphins are the catalysts that stimulate the motivational and play levels of the participants during the two private swim sessions and three private dockside sessions. All activities are based on the needs and abilities of the individual. Each person’s sessions differ, according to their goals. One-on-one interactions with the dolphins may be just what the individual needs to reach beyond their day-to-day routine and try new things. 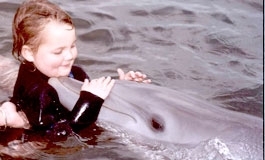 Wish Foundations send us their very special children, knowing that they will enjoy a very safe dolphin experience while making their dreams come true.The dolphins create a unique, joyful experience, for the child, providing a special memory for all involved. DRC in-water staff are available to assist the Wish guests during the dolphin interactions, if need be. Dolphin Research Center (DRC) has worked in partnership with Wounded Warrior Project (WWP) since 2009, supporting goals that promote a healthy transition to civilian life for our severely wounded heroes. A rehabilitative cycling event designed to challenge our wounded warriors to get back in the saddle, both literally and figuratively. It also is a tool to help both the physical and mental wounds of war. 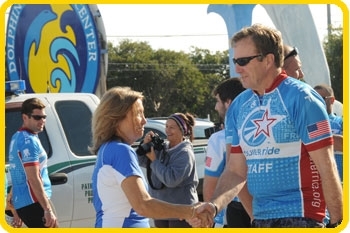 DRC helps support the goals during their scheduled visit along the Ride route with a dolphin swim and luncheon. DRC collaborates with WWP on one of their Combat Stress Recovery Programs called Project Odyssey. It was named after Homer’s Odyssey – a legendary saga about a hero’s journey home. The experiences gained from Project Odyssey help warriors work through challenges related to combat stress and improve their mental attitudes and outlook. A three-day retreat at DRC is designed for warriors diagnosed with traumatic brain injury and PTSD. Project Odyssey’s core goals of bonding with others on similar journeys, connecting with nature, and learning new skills in a novel setting is tailor made for experiences with intelligent, social dolphins. The dolphin sessions are scheduled in a sequence that allows and invites the warriors to smoothly move from their inner world to connect with their outer world in a stress-free, nurturing environment. Careful thought is given to optimize the participants’ experiences and help them accomplish the retreat’s goals. 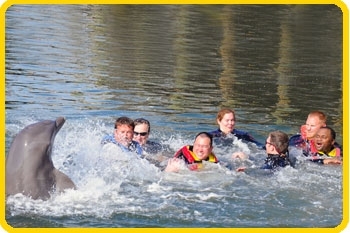 The warriors meet their peers on a parallel journey, participating in three days of dolphin interactions such dock sessions and a swim with the dolphins. DRC is proud to be a part of our heroes’ journey home. When a service member is wounded, ill, or injured, these changes place tremendous stress on family members, who may find themselves in a new role as full-time supporters or caregivers. DRC supports Wounded Warrior Project’s efforts in supporting families and caregivers, as well as their wounded warrior, by coordinating trips to DRC for some special dolphin time.